The Kawarau River runs from Queenstown to Cromwell a short drive east and is renowned for its white-water rapids… and for the extreme sports available all around the river. 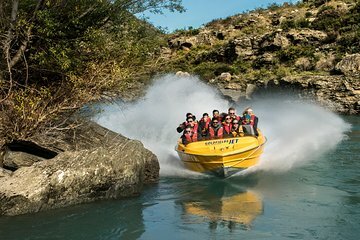 On this high-velocity jetboat ride, take to the river at Cromwell and speed between the sheer cliffs of Kawarau Gorge. Experience the thrills of riding a jetboat down the river, powering through rapids and doing high-speed 360-degree spins.